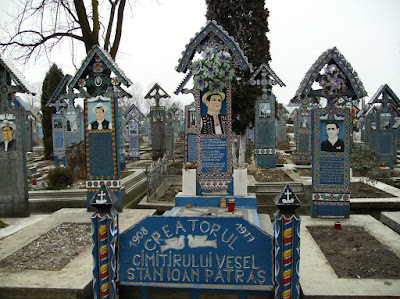 In the remote little village of Sapanta near Romania's border with Ukraine, the Merry Cemetery draws more paying visitors than mourners. Busloads of tourists pay about 40 cents each to meander the narrow paths among the 600 wooden crosses that capture the wit, work and daily life of a rugged and traditional peasantry. Everyone from the local barber, lumberjack, shepherd and gamekeeper to the village drunk are kept alive through carved and brightly painted pictures and earthy, sometimes witty, epitaphs. 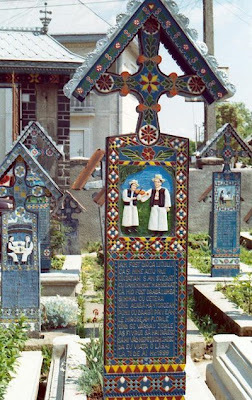 The crosses were created by a carpenter, Ion Stan Patras, who, in 1935, began personalizing his simple monuments. 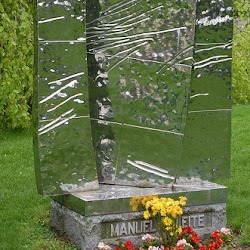 After attending the traditional three-day-long funerary vigils where Romanians gather to down plum brandy and tell stories about the deceased, he started composing brief poems to accompany his carvings.